Hello!!! Sorry for the lack of postings. I've been so exhausted lately. There's always a reason, I know. I have a lot of exciting blog post plans to come, I just haven't had the energy to write them yet. It's soooo hard dividing my focus between work and studying and other things, but so far nothing I can't handle. Yesterday, I went to Sephora solely because of the new Marc Jacobs makeup. I heard Tati from GlamLifeGuru on youtube talked about it on her Hot or Not video which is on every Thursday. She posts video from Monday to Friday. How awesome is that? You should check out her channel if you haven't. Anyway, I saw the packaging, and I'm not gonna lie. I am a packaging kinda gal. Fancy packaging intrigues me. Marc Jacobs packaging is really sophisticated for me. So I went to Sephora and checked out the foundation. I asked for the Sephora lady for a sample in the shade beige deep, and I got a little tiny bottle which should be enough for two to three uses. The packaging comes with a pump, so I don't have to concern for sanitary reason. I put in on a test today. It's said to be "a breakthrough gel foundation that's anti-aging, long wearing, awakens your skins to its ideal radiance and clarity." The consistency was a bit liquid-y. I needed to build up the coverage a little bit when I applied it on my face. t's definitely not a thick foundation. You know what? I love the finish. It gives my skin this glow. I don't wanna say it has luminous finish because it doesn't. But somehow, it can give you that healthy glow we are all looking for if you know what I mean. It has dewy-looking finish but not at all oily. Amazing! I got this lovely color-block necklace from ebay. Love the color! I didn't use a primer like I usually do because I wanted to see how well this foundation performs. It was such a hot toasty day in San Jose, and I could see the foundation still held up pretty well. I can still see my blush after several hours, which by the way is the indication of a good foundation. At the end of the day, I gotta say I really like this foundation. I know I just use it for a day, and I will continue to use it to see how my skin reacts in the long term. But generally speaking, I can see a great prospect for this product. 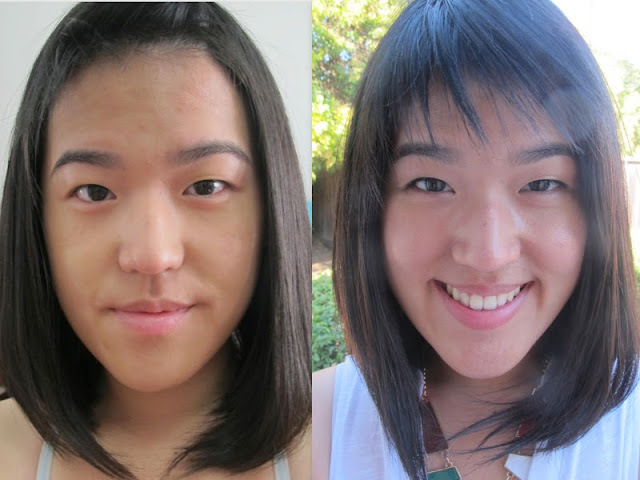 My skin was quite dry, and now it's in a semi combination stage. I don't know what changed. I did put a touch of Rimmel Stay Matte powder on my t-zone to control the oil. Oh and by the way, do you notice my new short hair? I just got it last week. Should have posted it last week. Oh well. I still don't know if I like it or hate it. I got mixed comments from my friends. But hair grows back. I was just so bored with my long fine hair, and I wanted a change. 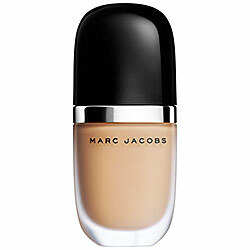 Have you tried the Marc Jacob Foundation?